An Exclusive Retreat Away from It All. Your affordable retreat awaits in the exclusive Diniwid Beach in Boracay, Philippines. The mere sight of the pristine shoreline fronting Orinda Beach Resort will tell you that you’ve arrived in paradise. This beachfront resort brings an experience as memorable and satisfying as the beauty that surrounds it—despite the budget rates. With our cordial staff ready to assist you anytime, enjoy our modestly furnished but very relaxing air-conditioned accommodations. Escape from it all and unwind fully knowing there are several other value-added services we offer. 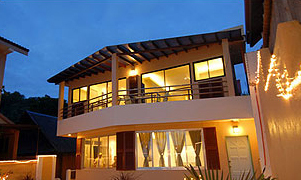 These include free transfers from Boracay port and complimentary breakfast. Orinda Beach Resort offers a rich selection of rooms at greatly affordable rates. Our Deluxe, Premiere, and Sunset Rooms boast a private bathroom with hot & cold water, cable TV,and plush beddings. Sunset Rooms even have a rainfall-style shower. The serene ambience at Diniwid Beach is enhanced by the warm hospitality from our staff. We provide in-room check-in service and free transfers from Boracay port to our resort. We also offer high-speed Internet connectivity. 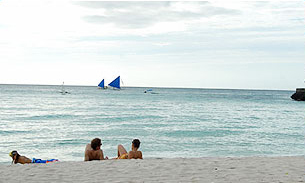 Staying at our resort grants you access to fantastic swimming spots and crystal clear waters in Diniwid Beach, Boracay. You’ll also have accommodations worthy of the resplendence that surrounds them. We aim to provide relaxation and serenity through our services, apart from our comfortable accommodations. We also provide high-speed Internet access. Further, our genial staff will always be ready to address your needs.